Whether it is about the proportion of taxes paid by different economic groups or the salaries paid to employees, the question “What is fair?” is often raised. Mr. Sun explores this idea by looking at a variety of societies throughout history. He evaluates the concept of fairness in a number of differing social and political groups as well as examining some common games like the Prisoners Dilemma. Out of this search comes his understanding of some of the complexities of fairness. As a psychological study, Mr. Sun’s book succeeds in analyzing different societies both past and present. He teases out issues and uncovers the underlying forces that factor into any consideration of fairness. While one might question a particular conclusion, the examples proffered are comprehensive and give us much-needed information about interpersonal interactions. What seems to be lacking is a strong case for the argument that this idea of fairness is somehow built into our DNA. The author cites animal behavior studies while missing the point that we can only observe outward behavior, not inner motivations. The neuroscience data he provides can just as easily be interpreted as showing a brain response to a situation, not the brain driving the action. The case for DNA causing behavior is increasingly falling into disfavor among scientists of many disciplines. With regard to religion, the author makes a mistake common to those who invoke evolutionary theory. Although much of his discussion focuses on Christianity in all its forms, he also mixes in other religions that have little to do with the Judeo-Christian tradition. His search for fairness as a foundation ignores within these structures very different ideas about right and wrong, sin and judgment that are found in religious communities around the world. Mr. Sun’s discussion of marriage throughout the ages puts a rather bizarre twist on history and religious practice. He argues that polygyny (mainly polygamy) was very much the standard practice until around 600 ACE. He cites animal studies that show very few species are monogamous. Mr. Sun then traces the history of the rise of monogamy and makes some extremely questionable statements. Although some Old Testament figures had multiple wives, this certainly was not the common practice as he tries to imply. There is no foundation for his statement that Jesus was not particularly hostile to polygyny (he does not cite a New Testament reference, but rather a 1994 treatise on plural marriage). What certain church leaders did show was their corruptness, not an acceptance of a marital practice. Also lacking is any treatment of conditions in modern polygamous groups where women are abused, families are broken up, underage girls are forced into sexual liaisons, and the young men of the colony are driven off so they don’t provide competition to the older men. References are provided for each chapter ad draw from a wide variety of sources covering several disciplines as well as consumer publications. Unfortunately, many of the references are not readily accessible. 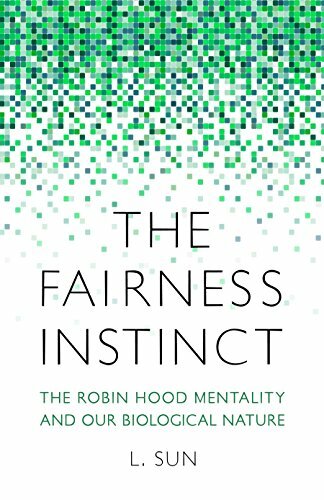 The Fairness Instinct raises many interesting questions about the behaviors of societies, groups, and individuals. Varying ideas of fairness in different populations and throughout history provide us with a challenging opportunity to assess the foundations of fairness and how this idea has played out in different times and places. But while it raises these questions, the book does not do a very good job of answering them.